Nick LaMonte is a man on a mission: to succeed in the luxury real estate market. And he’s well on his way. 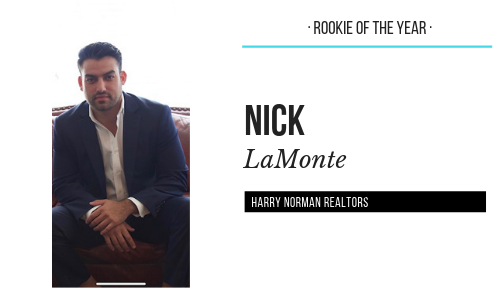 After only one year with Harry Norman Realtors, he was named the firm’s Rookie of the Year, and he is also Atlanta Agent Magazine’s Rookie of the Year. A native Georgian, LaMonte has a deep knowledge of the neighborhood and communities throughout Georgia. With years of sales experience, coupled with a competitive drive and ambition to succeed, LaMonte is making his mark. He continues to make strides to make his name known, not only with the real estate market but with his own clothing line and branding with his company. Want to know what’s going on in the housing market? LaMonte will tell you with his informational videos on social media helping customers gain knowledge about the market and their purchasing power. His Instagram @nicklamonte_realestate shows his mastery of real estate and communicating through social media. See all of the categories in the 2019 Agents’ Choice Awards.